Possibly the world's most famous river, the Seine not only captures our imaginations in the present day: it has mesmerized and seduced those who encounter it since pre-medieval times. Neatly dividing the city of Paris into distinctive left and right banks (rive gauche and rive droite), the river has served as a source of sustenance, commerce, and breathtaking perspectives since a Celtic tribe of fishermen known as the Parisii decided to settle between its banks, on the tiny strip of land today referred to as the Ile de La Cité, in the 3rd century B.C. That early settlement, later named Lutetia by the Romans, was to eventually grow into the sprawling metropolis we know and revere today. But it's easy enough to forget that the Seine, now mostly regarded as a source for picturesque photo ops and providing a route for a constant stream of sightseeing cruises, was the lifeblood of the population and one of the main reasons early settlers were drawn to the area to begin with. Since 1991, the Seine River has been a UNESCO World Heritage Site, which means that it enjoys legal protection and recognition as an important natural and cultural site. Read on to learn more about its history, and for tips on how to enjoy it on your next visit to the French capital. The river runs for 776 km (482 miles) through France and into the English Channel at Le Havre and Honfleur (Belgium). Its source is in the French region of Burgundy, and its mouth is the English Channel. In Paris, the banks of the Seine are connected by a total of 37 bridges, including the Pont de l'Alma near the Eiffel Tower, the Pont des Arts, and the Pont Neuf. The river's name originates in the latin word, "sequana", which some believe relates to a Gaelic name that would have been attributed by the earliest Celtic settlers. There is no consensus on the etymology, however. Most of you visiting Paris will want to visit and explore the banks of the Seine during your trip: it's one of the reasons it figures prominently in our guide to the top tourist attractions in Paris. We especially recommend that you spend some time on the following sights and activities centered around the river. Take a boat tour. Particularly on a first trip to the city, a sightseeing boat tour of the Seine will give you the opportunity to take in several important monuments and places in the city while sitting back and enjoying the ride. 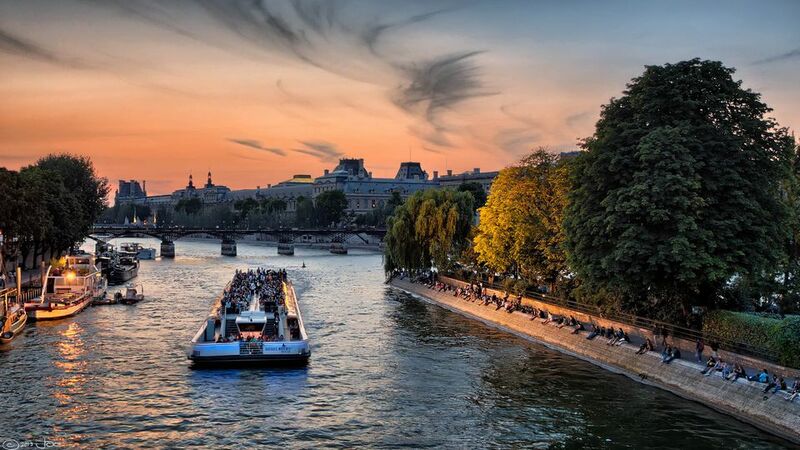 From Notre Dame Cathedral to the Palais de Justice and the Louvre Museum, gently floating on the river affords a particularly relaxing and gentle first experience of the city-- and can also be a great way for visitors with limited mobility to take in some of Paris's most iconic places. If you're visiting in the wintertime, not to worry: the vast majority of river cruise companies offer indoor, heated areas-- so you can still enjoy a cruise, even when icy winds or even rain prevail. Pack a picnic and sprawl out with a blanket on the banks. The banks of the Seine provide a wonderful setting for a relaxed Parisian picnic, particularly in the spring and summer months. To stock up on picnic goodies, see our guide to the best bakeries in Paris, as well as our list of the best gourmet food shops and supermarkets in Paris. Take a romantic or contemplative stroll. The riverbanks naturally offer some of the most romantic places in Paris for a stroll with someone special. Stop off at the Pont des Arts to admire the setting sun over the water, the ornate details of the bridge, and the Eiffel Tower on the horizon. The banks are also a great place for that solitary walk to help you think through a complex problem or project. I recommend starting near Hotel de Ville, crossing over a bridge into the Ile de la Cite, and ambling east to west on the right and left banks (I suggest ambling in whichever direction draws you). Browse books, posters and memorabilia at the old booksellers. Almost anyone would recognize the green metallic stalls of the old Paris Seine-side booksellers (bouquinistes), which have appeared in countless films and photos of the city. Whether you actually want to find an old, charming edition of your favorite book or just want to browse, it's a very pleasant way to spend an afternoon. Once you've explored the Seine, consider booking a tour of Parisian canals and waterways: the former might be the most famous body of water in Paris, but it's certainly not the only one worth enjoying. You can even book a day trip to tour Marne River by boat-- something most tourists never think to do. A picnic on its verdant banks, which once inspired impressionist painters including Sisley and Manet, is one of the loveliest spring and summer activities in the Paris region, and one I fully recommend. Also consider taking a day trip outside Paris, including to Claude Monet's house and gardens at Giverny, with its lovely waterlilies and tranquil streams.